No. 20, Jalan Haji Abdul Karim 26/KS2, Taman Klang Ria, 41200 Klang, Selangor, Malaysia. 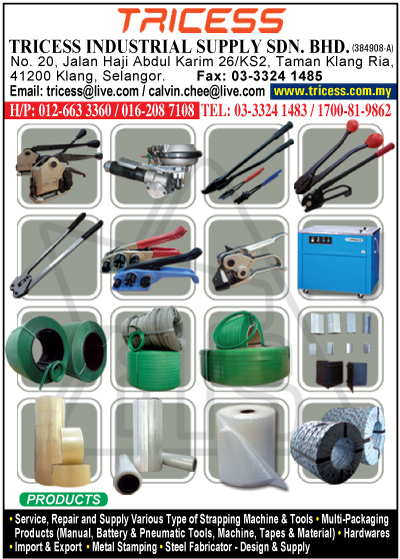 Tricess Industrial Supply Sdn. Bhd. has been set up in Malaysia on April 23, 1996. During the humble beginning, we only supply of strapping material and tools. Today we have expanded our networks to supply packaging materials (metals & plastics), strapping machine (services & repaired), and supply of labours & material for all requirement for your packaging needs, we strongly believed in quality, cost saving, efficiency and increase in productivities. In this competitive market, as a trusted vendor, we always provide solution to your packaging needs not forgetting safety, reliability and high-technology ever ready to served to your urgent requirements. With this brief short details of our company we hope we can able to have an opportunity to work together for mutual benefit.